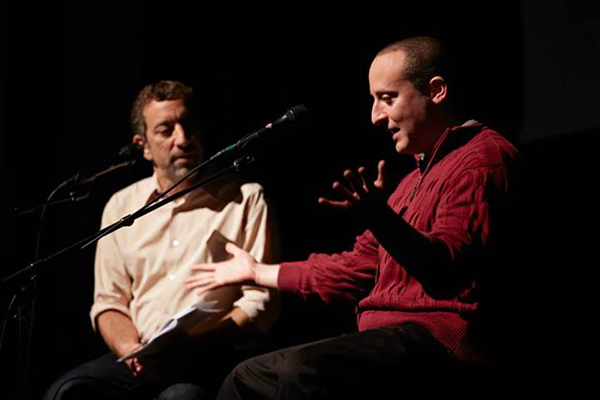 Josh Cutler talks about making his audio diary with Joe at our recent live show in Chicago. “There’s an incredible series of documentary films that started in 1964, where filmmaker Michael Apted got to know fourteen British children and then returned to them every seven years to document how their lives were unfolding. The first was Seven Up! The latest is 56 Up. But until this year, I don’t think anyone ever attempted this on the radio. Then our colleagues at Radio Diaries returned to a group of teenagers they’d originally handed tape recorders to 16 years ago and did a fascinating series of stories that aired on All Things Considered. Each kid was now roughly twice the age they were the first time around and of course not a kid at all anymore. Melissa who’d been in foster care now had two kids of her own. Josh who struggled with Tourette’s had become a school teacher! Didn’t see that coming! The radio stories they made about their own lives are as different from the Apted series as radio is from film. More intimate. And of course much more from their point of view. They have a beautiful webpage with all the stories, and a Radio Diaries podcast. I mention all this because Joe Richman, who created the series, is coming to DC this coming Tuesday to do an event with Josh and Melissa. All Things Considered’s Melissa Block is co-hosting. It’s a rare look at the making of some very unusual, very special first-person reporting. They show pictures and tell stories and Joe’s a real sweetheart. You can see why people open up to him and say such revealing things in his documentaries when you watch him talk and joke around with the diarists onstage. Thanks Ira! Details: The show is on Tuesday November 12th at the Sixth and I Historic Synagogue and Performance Space at 7 PM. After party at Busboys and Poets, 5th and K. Get your tickets now!